48 Interactive lesson plans fuel a one-of-a-kind SEL curriculum that turns our episodes into impactful classroom time. With an education portal and training videos, it’s easy to get started. Kids can bring the fun of Q Wunder home, with our award-winning mobile app for iOS and Android. Reinforce the classroom lessons with additional games activities and bonus content. Q Wunder offers a full range of research-based products including our award-winning board game and activity cards to our plush breathing buddy and books. It’s tough being a parent! That’s why we provide regularly updated original articles, videos and podcasts for parents to reinforce what their kids are learning. 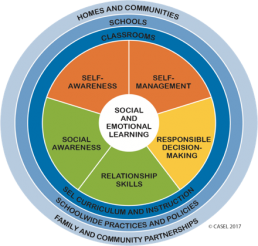 Our content leans on the principals of The Collaborative for Academic, Social, and Emotional Learning (CASEL). Using the core competencies of Self Awareness, Self Management, Social Awareness, Relationship Skills and Responsible Decision Making, we have created content across 15 topics including Grit, Motivation, Empathy, Focus and Patience. Whether it’s studies showing impact on academic outcomes, equity and poverty or lifetime success, Q Wunder is built on what works. Like you, we value the safety of our children. That’s why we’ve gone to every length to ensure we provide a brand you can trust. We stay up-to-date with COPPA standards, are KidSafe Certified and ensure your data stays secure. These same high standards are reflected in our content and products. Awarded several times over, Q Wunder takes pride in being recognized for each and every award we’re given.